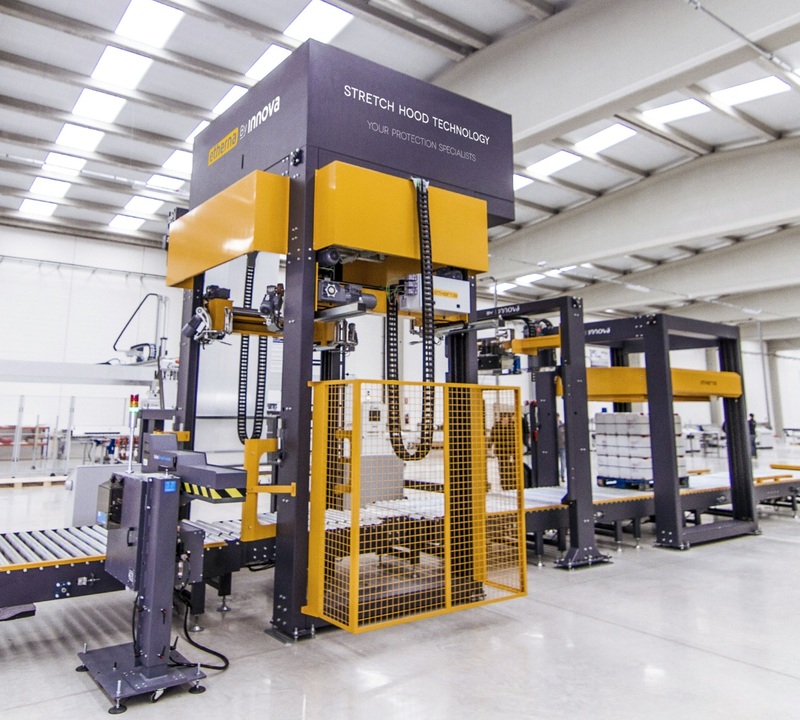 We design and manufacture an automated packaging project that fully integrates into your production line and pre-existing systems. 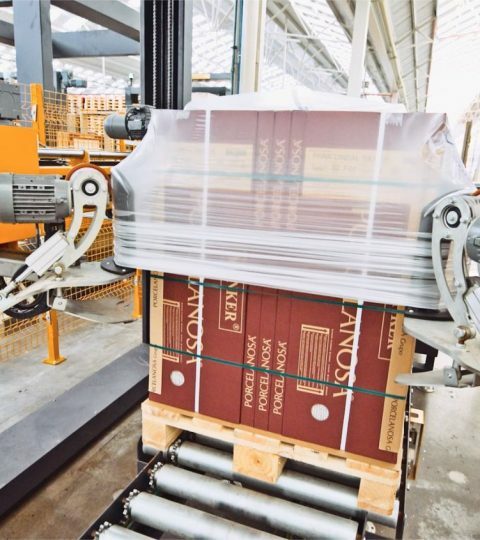 The Innova packaging line adapts to and links with your logistics system, allowing a smooth connection between production, intelligent warehouse, and shipments. Manage your entire end-of-line with a unique provider that guarantees reliability, flexibility, full performance, and immediate responsiveness. What do you need for your final packaging? What are the different elements of the Stretch Hood packaging line? The line consists of the Stretch Hood pallet wrapping system plus conveyor solutions, load stabilization, and any extra protection that might be necessary according to the needs of the client. How is it integrated into my end-of-line production process? For every project, we study the integration with the production line in detail: measurements, space, control and automation systems, etc. The Innova engineering team evaluates and designs the packaging line that suits best the needs of the client while always seeking better protection and stability for the product. Can I use my own conveyor elements? In most cases, we try to make the line as compatible as possible with the existing pallet conveying elements. Our conveyors and lifts adapt to any standard systems used by the client. How many elements can I configure with the line? All elements can be configured beforehand, depending on the project. We can install a Stretch Hood system plus the corresponding conveyor elements, or a complete line with whatever variety of items that installation requires. What are the standard measurements of the packaging line? How much space does it occupy? Thanks to the unique, slender design of Innova machinery, the line can be installed in a smaller space than is usually needed. What pallet types can the line work with? The Stretch Hood line is designed for the most typical pallets from several sectors, such as construction and tiles, chemical, agri-food, etc. The minimum pallet measures we work with are 800 x 600 mm and the maximum are 2000 x 1400 mm, but if you use other measurements, let us know and we will check the viability of the project, commitment-free. Can I integrate the packaging line with AGV solutions? Yes. 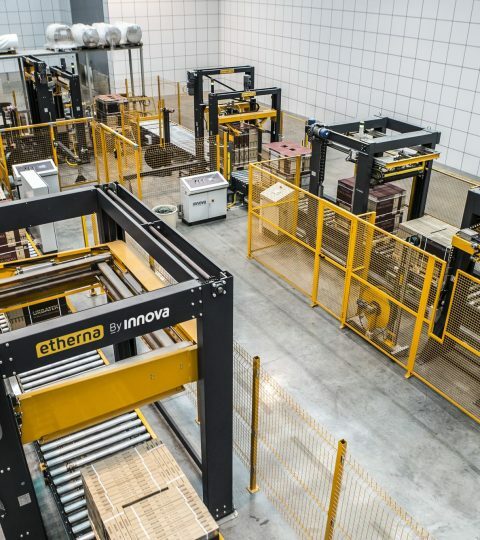 In fact, Innova's packaging line is configured for integration with intelligent solutions and Robotics 4.0. What automation and PLC systems are compatible with Stretch Hood and the packaging line? We offer integration and compatibility with systems such as Omron, Siemens, Rockwell, Schneider, and more. Ask us about the compatibility of our system with your business, commitment-free. 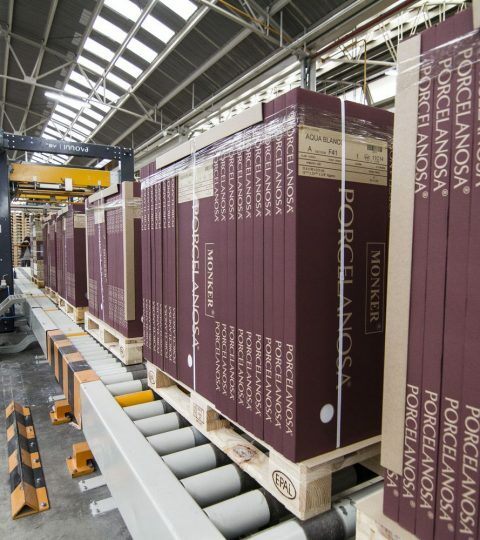 Is the packaging line compatible with Industry 4.0? Yes, the line has already been designed for integration with Machinery 4.0. For example, labeling solutions connected directly to your CRM are offered in the line.